Designer office furniture has changed immensely over the past 50, 25 and even 10 years. While options are always a good thing, too many can also be overwhelming when it comes to finding the furniture that best meets the requirements of your office and organization. This article takes a closer look at what you need to know to make an informed choice. Your office immediately conveys a message to clients, potential employees, job applicants and others who walk through the doors. The content of that message is up to you. Office furniture can indicate your corporate culture in a way that words cannot. Are you hip and edgy? Conservative and traditional? Something in between? Choosing the right office furniture is a simple way to get this message across. But an aesthetically pleasing office doesn’t just make a good impression for visitors; it also benefits your workers. Research shows that happy employees are more engaged, resulting in everything from lower attrition rates to higher productivity. By investing in attractive office furniture that is consistent with your corporate culture, you can keep employees engaged and better support their able to succeed in their jobs. Of course, it’s not all about looks. One of the most amazing things about 21st century office furniture is its profound potential when it comes to functionality. The most innovative office furniture is not simply a place to sit or work at your computer. Rather, it’s a means to do your job better — more efficiently, effectively, and even more safely. When choosing office furniture, look for pieces with innate features designed to add functionality without taking up space or interfering with your work process. Consider the contemporary cubicle. While cubicles were originally designed to give employees privacy, they offer much more than that. Depending on the needs of your employees, features like built-in task lighting, overhead storage, sound-proofing and even electrical wiring can support your workers’ comprehensive job performance. And don’t forget the importance of ergonomics: choosing ergonomic designer furniture can help reduce absenteeism, lower worker’s compensation claims, and result in overall improved employee health and wellness. Cubicles are no longer reserved exclusively for entry and mid-level employees, either. More and more companies are opting for executive cubicles for managers and administrators. These types of cubicles are typically larger than standard designer cubicles, and can even incorporate meeting space for everything from performance reviews to team meetings. No discussion of office furniture is complete without a look at prices. 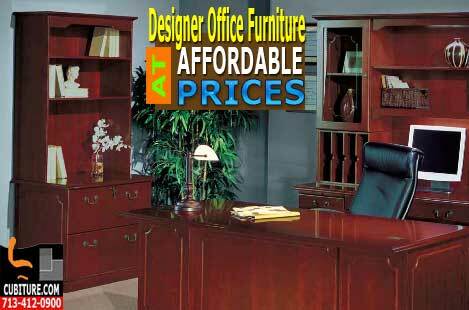 The truth is that prices for office furniture range widely. However, it’s not enough to go by dollars and cents alone. If chosen wisely, your office furniture investment can pay dividends for decades. Shoddy, cheap, or poorly made office furniture, meanwhile, is more likely to incur premature repair and replacement costs. One designer office furniture shopping approach embraced by today’s budget-savvy office managers? Used and re-manufactured office furniture. These typically offer the same benefits you’d find in new pieces, but at much lower prices. Ultimately, selecting the right best designer furniture isn’t simply a matter of picking a desk, executive chair or file cabinet. Rather, choosing wisely can be a strategic measure to help you reach your business goals. And don’t forget: it’s not just about choosing the right furniture, but also about integrating it into your space in order to minimize waste and maximize results. Cubiture’s professional space planners can offer valuable assistance every step of the way.